Today, more and more students have to go abroad for internships, language study holiday, studies in Erasmus Programs, etc. This journey can quickly become an assault course to organize. 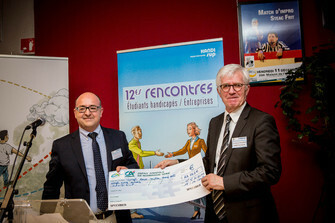 Since 2010, with the financial support of Crédit Agricole Normandie - Seine, Handisup Haute‑Normandie has facilitated the disabled students’ mobility during their stays abroad. The financial support of Crédit Agricole Normandie-Seine arises from the reversion of one euro for each subscription to the "e-bank account statement” received from Crédit Agricole’s customers. On Thursday, October 16th, 2014, Mrs. JARDIN, Deputy Chief Executive Officer of Crédit Agricole Normandie-Seine and Mr. MALANDAIN, President of HANDISUP signed a new convention which extends the project until 31/12/2015! HANDISUP has established contacts with universities and foreign companies in particular in Ireland, in Switzerland, in Quebec, in Spain, etc. Thursday, October 15, 2015, Mr. Malandain, President of HANDISUP Haute-Normandie received from Mr. Sauteret, HR Manager of Credit Agricole Normandie-Seine, the present € 22.925 check as grant for the international project in which our two structures are involved. It was an important moment for HANDISUP, which will be able to accompany students in their studies projects or internships abroad this year. Since the beginning of the project, exchanges and information meetings are organized at the end of the year. 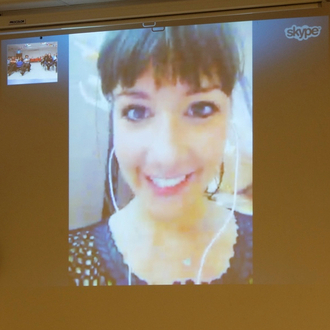 These meetings aim at presenting the "HANDISUP-International» Project and at drawing up the balance sheet from students' testimonies having already left or being currently in study abroad. We will attend our next meeting with new testimonies, on Friday, November 27th, 2015, at University’s House in Mont Saint Aignan.